It was great to bump into the website for the Melodyne editor at Celemony whilst doing some other research. The really cool thing is they have a full demo for Mac and Windows that lets you play with 9 seconds of any tune you care to throw at it. I used one of the loops from Garage Band, but only a little bit on this video just to show how simple it is to edit. The first play is the original but then I move one note up. Note that in this particular view there are other notes playing too as it is part of a chord. So from a Wav file even I can change the individual notes of a track ! So this is me simply importing a wav (in seconds), and dragging a note. Done! @andypiper has just come back from a long work trip, on his way back at one of the lay overs he invested in a Parrot AR quadricopter (@ardrone). I was most honoured that he offered to bring it around Feeding Edge HQ so I could have a look and a play with it. This would be cool at any time but was very timely as I needed to get the feel of it as it is likely to be an item on the Cool Stuff Collective. It does a load of things that are really very clever. 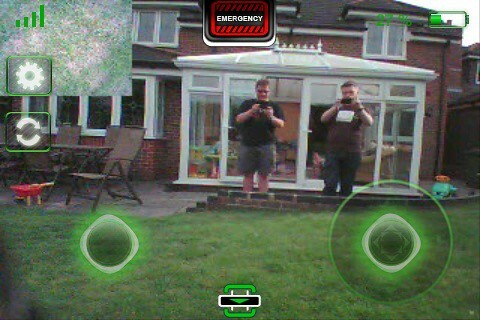 The front and down facing cameras are very neat, in particular as it is self stabilises giving you time to look at the video stream on your iphone (which is also the controller for the copter). The ultrasound sensors on the under tray help keep the copter stations over the ground at the height you set. As out garden has an odd slope in it it was cool to fly the drone at the tier and see it lift itself up as it flys the contour! Andy was very brave in getting pretty close to the Drone at the end of this film. Whilst it copes with the odd gust of wind it can still slew a little outside, but I think the against the sky shot he got is awesome. I think we should have no problems zooming this around a nice still TV studio. Other cool things that I did not realise about the drone is that it generates its own ad hoc wireless network, has an embedded linux on board and you can telnet to it ! It can also seek an AR tag to land on and detect other Parrot AR drones. You can screenshot the iphone app interface, and soon be able to stream the video. It is very very cool indeed. Thanks Andy ! Yesterday I headed up to Camden to the MTV studios bright and early for the filming of the studio parts of episodes 1 and 2 of the Cool Stuff Collective. It was a very interesting and cool experience though being the first 2 shows there was a certain amount of chaos. Archie Productions and the team obviously do lots of work in the industry but piling into the studio is really like starting from fresh again. It was great to meet Sy Thomas the main presenter, though I got to see him work first from the production desk which is one of the most button laden gadgets you will ever see. It’s like the bridge of the enterprise. Producer Matt was dashing around doing all sorts of things the level of energy for the whole day that the team had was amazing. Whilst waiting for my big moment I was in the MTV canteen with the guys from Print-It 3d, Ian and Mike and Anne Marie from Anarkik Angels. Printit-3d are based in Wales and Anarkik Angels in Edinburgh so everyone had made quite a trek. Printit-3d had brought along the VFlash Desktop Modeler from 3d Systems they are the authorized suppliers of that and of the new Pro Jet 3d pinter. The VFlash is amazing in that it is only £10,000 but produces amazingly detailed and complex models. The guys had so many samples that they opened up on the table we drew quite a crowd form lots of other people milling around at MTV. 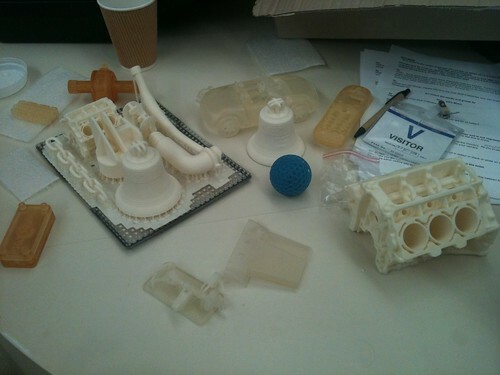 The system uses liquid plastic but also wax which allows it to print complex moving pars, gears and cogs. The Pro Jet printers much more expensive but the precision and edges it produces on devices feels like machined metal. I have talked about and seen lots of things in 3d printing but I was blown away with how good this stuff has got. The Pro Jet sample that got my attention was two plates that were bolted together in four corners, when undo the bottom plates were two blocks that slid together on rails. All of that got printed in one go. In the picture above you can also see a complete plate of prints in the tope left the build platform on the VFlash is about the size of a small laptop. The guys had a sample of an entire chess set printed in one go. Each chess piece wwas very intricate with hollow areas in the rooks with small spiral twisting staircases inside them. Whilst I was waiting and checking the script to fill the time and calm any nerves I decided to rehearse the flow in Opensim. The flow of the piece went from showing a regular printer on the left, then an intricate chess piece, then the printer, followed by the description of the transition from computer model to printer. The layered planes toward the right of hte picture are for the description of the process. Then a table full of samples. The brick wall was to mention printing houses and finally the big sphere is saying how this changes the world. Anne Marie had brought the Falcon Haptic device and AnarkikAngels brilliant Cloud 9 modelling package. Everyone who creates a sphere or block in this and then pushes on it with the force feedback device gets an astounded look on their face. Andy Piper captured some of this back in 2009 when Anne Marie visited Hursley. At some point in the afternoon I was called into the studio, the Haptic device was up first, which was interesting as I was more mentally prepared for the 3d printer but it made sense to go that way around. Part of the programme is that Sy Thomas is the disbelieving, confused one across it all. He is the main draw for the show and it was great that he was so cool about me just turning up. I felt pretty much at home, though some uncharacteristic nerves meant I managed to fluff my first line. Sy had a few goes at some of his first as whilst scripted the proof of it is when its done for real so it is adjusted. 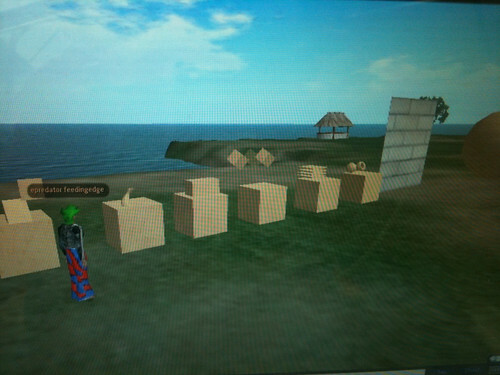 This was also a live demo, in I that the plan was not for me to drive the device by for him to do it. That worked brilliantly as he just got on with it and then described the wow experience that we all get using it for the first time. Whilst he can and does act in this case this was the same genuine wow which I thought was very cool indeed. It was then a quick tshirt change and the 3d printer and all the samples and prints were wheeled in. 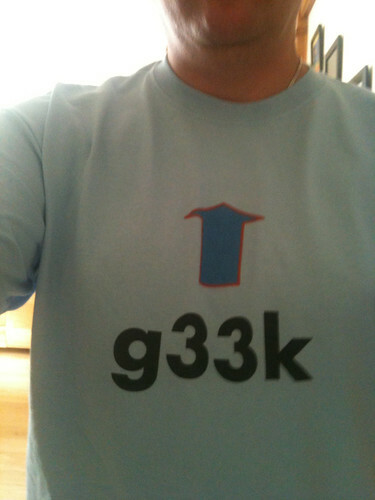 The Tshirt was one I threw together on cafe press as an example, the production team then went ant got a stack of them made up in different colours. So g33k will be replacing my stripey leather jacket in personal branding stakes if this all works out 🙂 Several people in the foyer at MTV asked what G33K was 🙂 which I guess was the point. The 3d printer item went pretty well. The VFlash was going to be opened to reveal the chess set but the second take we did of the item seemed to be flowing so well that opening the cupboard door felt like it did not fit. I hung around after that was a wrap and ended up in the tail item for one of the shows too. I wont spoil the suprise. Hopefully my little 3 min set called Ian’s world in cool stuff collective will work in the edits on Monday as they programme is put together. In two weeks time we do it all again, but it will be much easier. You can see the trailer here with Sy doing his thing. On my birthday trip out we all popped along to the National Motor Museum at Beaulieu. 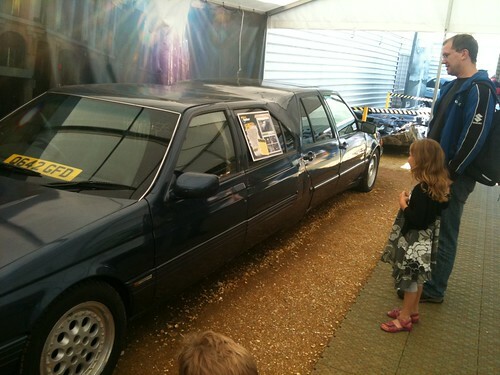 It now has a special exhibit which is the contains many of the results of the Top Gear challenges. 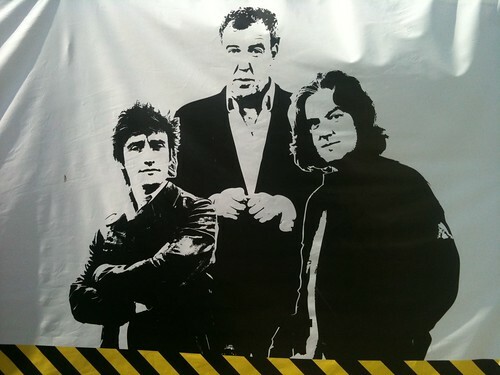 I find Top Gear both hilarious and inspirational, and being a moderate petrol head its also a good subject matter. Seeing the fruits of the production teams labour shows some brilliant, but deliberately flawed ideas. Everything tends to “not go quite as we expected”. Which is of course the sort of thing you would expect like bolting the two fronts of cars together to make it easier to get away in reverse as above. Its all brilliantly visual, but any techs out there know that this sort of mad idea and bolting together of things that shouldn’t be bolted together goes on all the time in software, you just can’t see it. 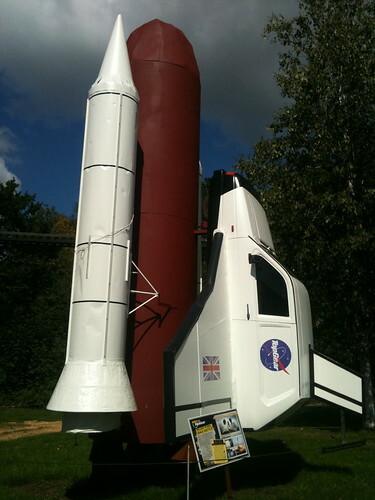 Many a time I have seen a project strap the software equivalent of a Reliant Robin to a large rocket on a tight budget in order to emulate the space shuttle. Of course the spirit of engineering is to know when to smash things with a hammer and when added strength and design. Top Gear deliberately makes sure they tip the wrong side or working for comedy effect. The cascade of constant changes and challenges their set piece projects face also mirror what we see all the time. Make something for one purpose and then a hand delivers a new envelope which is sort of what it was meant to do but requires a bit more hacking and bodging on top. I shouldn’t delve too deeply in the clever approach they have developed, it ruins the magic and the humour. There is of course a production team hard at work for these guys, whilst they generally shun the sort of tech I deal with on a daily basis they are in fact geeks cut from the same cloth as the rest of us. In order to hack and bodge things you do actually have to know how to to things properly in the first place, its kind of like Jazz, you need to be a skilled musician to improvise.